Our apologies for the delayed postings. 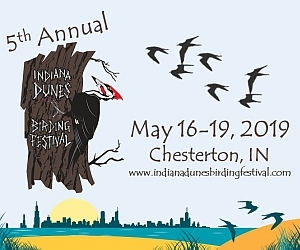 With the Dunes Birding Festival and general spring bird craziness, we’ve not had a chance to give an update recently. As most know, the north winds have set up a block and really slowed down migration here in the dunes. Many neo-tropical migrants have been delayed up to a week. The state park’s first Cerulean Warbler of the year didn’t arrive until May 8 (the day after the festival! ), when they typically arrive in the first days of May. Today, the park’s first Acadian Flycatcher finally arrived, days behind when we usually get the first one. Diversity is still climbing however. In the last three days, 12 new species have been logged flying by at the tower site. This is WITHOUT south winds! They include: Ovenbird, Tennessee Warbler, American Redstart, Magnolia Warbler, Black-throated Blue Warbler, Least Flycatcher, Swainson’s Thrush, Wood Thrush, Cape May Warbler, Warbling Vireo, Summer Tanager, and Blue Grosbeak. Clay-colored Sparrow at IDSP Tower Feeders. Of note in recent days has been a Clay-colored Sparrow visiting the feeders. It was present on May 9 and is still there today, May 11. Despite the winds, the tower stands at 184 species for the year. Wednesday’s most recent count list is here.